I recently found the work of a Dutch photographer and lace collector who spotlights her antique collar collection in a beautiful way: she photographs the collars worn by young women, and digitally finishes the pictures in the style of the Old Masters. Her name is Tineke Stoffels, and I think her online exhibit will be of interest to lace-lovers here! 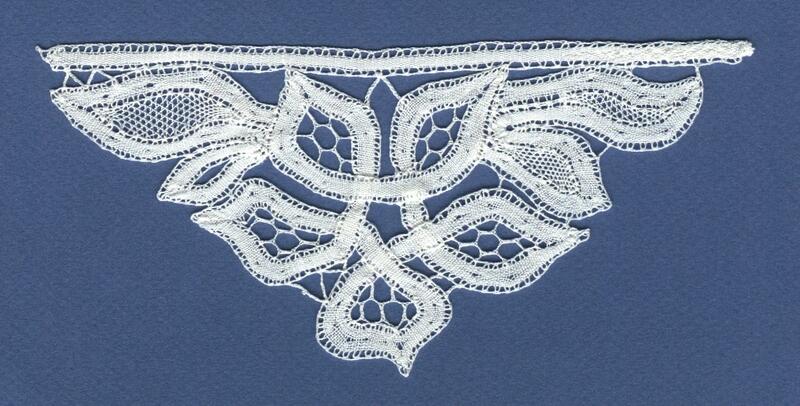 When I reached out to Tineke Stoffels, I found her very kind and enthusiastic about lace and handwork. I had the pleasure of interviewing her, and she was even kind enough to take close-up pictures of some of the collars so I could talk about them on my blog. I used the photos to practice lace identification, and I think I did okay with two of them, but for the bobbin lace collar I lacked the expertise to say anything of value. That's actually what led me to join this site, so I can learn more about bobbin lace styles! If you're interested in the interview or the close-ups, that blog post is here: https://www.robesdecoeur.com/blog/tineke-stoffels-little-white-collars . All Tineke's photos are used with her permission in that context. I wonder if anyone here can tell me anything about the collar labeled "Milanese"... it is a bobbin-made tape lace, so I think calling it Milanese is a safe guess. I'm curious about the bars holding the tape together: was I right in saying that the threads of the ground were made at the same time as the tape, from the same threads? Or were they added later, after the tape was made? Thanks for posting the websites. Love the collars worn by the younger girls, especially the very first one on the first site. That one is gorgeous..! I've been away from bobbin lace for a while now and I am also wanting to get back doing it again. I have no teachers here, but lots of books. This is interesting. It will take considerable study to reply. Give me a few days. Anybody have comments? Karen - Some comments on your examples. The lace in the red square is a machine lace, imitating bobbin lace. Look at the red line. Parallel to that are lines in the dense areas. That occurs in some machine laces, but not in handmade bobbin lace. In the handmade stuff the vertical and horizontal lines would be exactly equal, as in woven cloth. The bobbin lace in the blue box MAY BE bobbin lace. 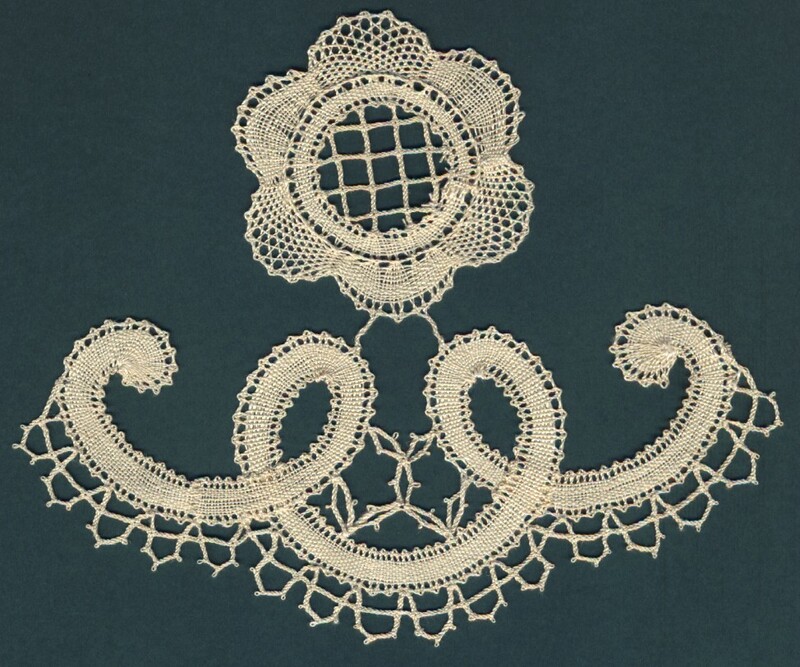 It is clearly in the style of Valenciennes bobbin lace from around 1900. But I would need far better detail, much closer up, to be sure. A lot of handmade Val was made, but so were machine imitations. The one you have identified as "Chemical lace" is chemical lace. The one you call "Gros Point" is not true lace at all, and I would avoid using those words in referring to this piece. It is an embroidery with some dimensional elements reminiscent of gros point needle lace. The distinction is that if the woven fabric remains as a permanent part of the object it is embroidery. True lace has no woven cloth remaining as part of the finished object. Your example does have some areas with the fabric cut out, then the empty spaces are filled with needle lace stitches. Danish Hedebo does that, but I would not call this Hedebo. It has similar elements, but not the same stitches and motifs. Here are some examples of true gros point needlelace. The one called "Milanese" is definitely hand made bobbin lace, but has none of the elements of the lace we call Milanese. They typical thing for Milanese is that fancy stitches are done inside the tape, very complex decorations. Here is a diagram for how a lace maker crosses one tape over another -- my diagram. All the laces in my previous comment are mine. The first is from a Bruges Bloomwork workshop. The others are my original designs. Lorelei, you are amazing! Thank you so much for the diagrams and pictures! I didn't realize bobbin lace was worked wrong side to the worker... when I do needlelace, I am seeing the right side of the work, and when I take it off its backing, the previously hidden wrong side looks weirdly flat in contrast to the raised cordonnet of the front. So let me see if I understand this: when working from the wrong side, you have to think about laying the first layer completely, because it'll be seen, and then when you cross it, you can kind of take a few big steps over? Your personal examples look really cool, with the tape weaving under and over itself like a Celtic knot. Re: the machine-made lace, I had noticed the parallel lines in the denser areas, which I think means it was made on a Leavers loom. But even with close-up pictures, it's hard to differentiate between different machine styles. As for the embroidered one, I put "gros point" in quotation marks since that's what it's titled in the exhibit, but I know it's lacy rather than true lace. I wonder if the maker had seen gros point de Venise or a picture of it, and made the embroidered collar in imitation? The embroidery/cutwork version would have gone together so much faster than true gros point. It's still quite striking, though, and it's interesting to see one art form imitating another. I have re-worked my blog post's wording to make it clear that the collar is not gros point, but simply borrows some elements for embroidery inspiration. Thanks again for your feedback and for your help with my questions!